...keep getting better. I have got so many deals for you today, I feel like I'm that furniture salesman in the Gallery Furniture ads (fellow current and former Houstonians get this reference, the rest of you, just smile and nod). At the beginning of the month I introduced you to my lovely, new sponsor, r0ssie and her amazing supplies for all things itajime. Well, r0ssie has a special offer for you today and I've combined that with a dye tutorial and...Dharma Trading Company, home of more dye supplies than you could shake a turkey leg at, is offering my readers, that's you people, a special freebie. It's all so amazing I don't know where to begin. How about a little encouragement for those of you who might be on the fence about trying this technique. I finished this quilt earlier this week and like my Twinkle quilts both large and small, all the shapes are dyed not pieced. This is r0ssie's latest itajime venture. She's not only combining a variety of differently sized shapes, but an innovative shape she designed called the reverse twinkle. The circle is cut out of the square. It's brilliant and practically makes my head swim with possibilities. If you're still concerned that this craft might be more than you can handle then let me provide you with all the knowledge you'd need to clamp your own fabric sandwich, mix a dyebath and dye your fabric. I've titled this tutorial Clamping and Dyeing Fabric: A Basic Itajime Primer. If you click on the link in the right hand sidebar, it will take you there. Are you ready to get started? Do you want to gather your supplies and dye like a crazy person? Good. The first step is to get some of the essential materials you'll need to craft your own amazing fabric. Where should you go? I'm so glad you asked because I have a definite opinion about this. I have been a customer at Dharma Trading Company for at least 15 years. I buy all my dyes and undyed fabric there. I used to dye pre-sewn white garments and I bought those at Dharma as well. I love the place and I'm giving it my stamp of approval. You don't have to buy large quantities to purchase from Dharma. They sell dyes in 2 ounce containers. You could pick up a few colors and some of the auxiliary chemicals(check the tutorial for a materials list) and you'd be ready to go. Also, because I want you to try this technique and r0ssie wants you to try this technique and the folks at Dharma want you to try this technique, Dharma Trading Company is offering a free 2 ounce jar of dye to anyone who places an order using this link. The second step is to get some of r0ssie's wonderful shapes. You can do that by following the link on my sidebar directly to her online store or you can leave a comment here and be entered to win what can only be described as a smorgasbord of shapes including her newest offerings, Reverse Twinkles. The shapes offered in the giveaway are the same ones r0ssie used to create the quilt top pictured. She calls this design her Kalka Quilt because, "it is half inspired by Kaffe Fassett and his lovely way of scaling blocks up and down and half inspired by Malka Dubrawsky and her twinkles." An entire Kalka bundle is up for the taking. That's three pairs of 2" circles, three pairs of 3.5" reverse twinkles, two pairs of 4" circles, two pairs of 6.5" reverse twinkles, one pair of 6" circles,and one guide for cutting a 9.5" block with a 6" circle in the middle. This is an unbelievable giveaway. There are no excuses left. Leave a comment, stop over at Dharma Trading, and let the fun begin. I really want to dye fabrics again. I also wanted to ask about your quilt hanger, is that from IKEA? It looks similar to one I've seen there. 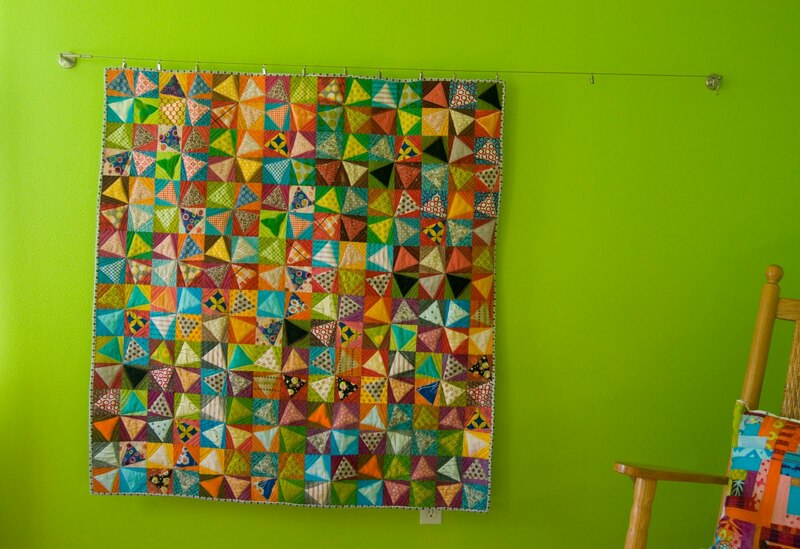 I need a better way to hang quilts and I love what you have. So wonderful! I would love to try your techniques, and having the right tools would definitely go a long way toward being successful at it, I'm sure! I would so love to try this! It would be like an early Christmas present! Wow, this is so neat! I really want to try this but am still feeling nervous! This post helped a lot!! I've been tempting to try this technique so I can't wait for the tutorial! I have spent a small fortune to take art classes that I have had to adapt to fiber. I am so excited for artists like you that share information with us newbies! I only have gray dye so I need to invest in a wider variety! Love love love this stuff! The possibilities are just swimming around in my head. I want those shapes more than I can say. I would love to win this giveaway. I've been wanting to try this for quite awhile, but been unsure where too begin. We watched you do this on quilting arts and my daughter and I wanted to do this...I just ordered a couple shapes on Etsy but would love to win this set! Thanks for inspiring and making it so much easier to get started! You definitely have me interested! What an awesome giveaway - so hoping I'll be dying my own fabric very soon! Definitely something I want to try! You are very generous in sharing your "trade secrets"! 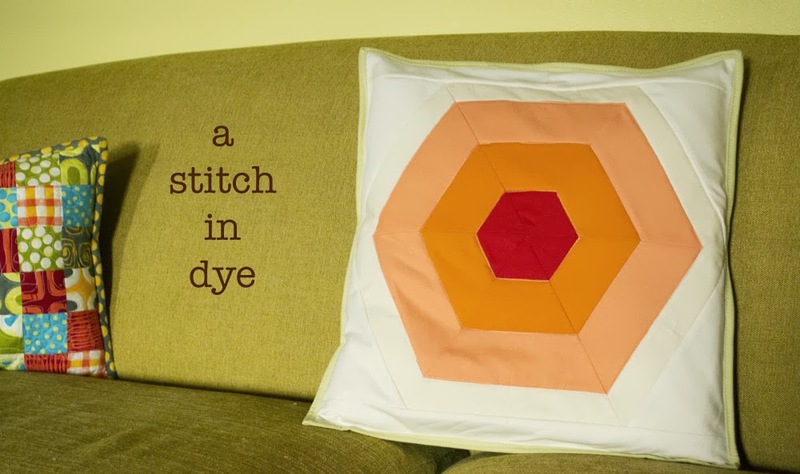 I recently watched a Quilting Arts program showing this technique and would love to do this project with my daughter. Your finished quilts are amazing. Man, I just ordered some other shapes, wish I had waited to get some of these too, would be awesome to win some! Will have to buy some regardless, the possibilities are endless! oh my good.ness Malka!!! I have some of Rossie's shapes but haven't used them yet since I'm still collecting other necessary supplies. I'm REALLY loving the triangles, so awesome! Thanks for offering up this amazing giveaway!! I would love to win, and try this out. I would really like to try this technique and having these tools would obviously go a long way toward getting me started. Thanks! How clever clamping the open circle shape down and then dying the fabric. I did some great dying many years ago and now you have INSPIRED me to take it up again. Thanks for the great give away. OOh I hope I win. Yep, this is something I would like to try. Thanks so much for the giveaway. Looks like it's time to finally invest in some REAL dye! What's the chance that this quilt will appear in your shop? My new office is begging for a burst of color! this is awesome. would love to try this out. I am scared to death of this technique and yet fascinated so bring it on and I'll give it a try...winning would ice the cake! I have been dyeing to try this technique so please count me in and please, please, pick me! That's awesome! I have some kids to work on a project with, and I think this will be perfect! Thanks for the Dharma link - hurray! So excited Malka! I cleaned out my toolbox and found 4 clamps last week. I was so excited because I read your first post about r0ssie's shapes. I just placed my order for dye with Dharma. The only thing missing is the shapes. Thanks for the inspiration ... and the dye!! Aack - The Circle in the Square - bloody brilliant! I can only imagine the fun you will have with this idea. Sign me up for a chance to get in on the fun, too, please - and congratulations on inspiring a quilt together with Kaffe! It's really hard to believe those triangles are DYED. I need to find out more about all this. Oh I would so love the goodies. I've been dying my circles with peanut butter jars (empty) weighted down with cans and Dutch ovens. this would be oh so much more practical and efficient! 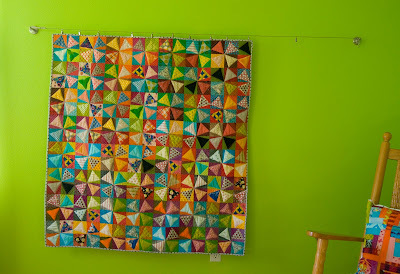 Very cool quilt - so vibrant! Who wouldn't like to try this technique! Thanks for all your help and the opportunity to win! i love this technique. 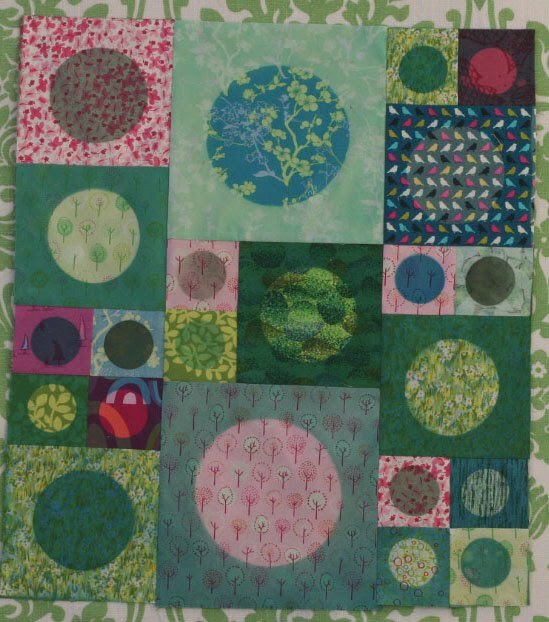 i love to freezer paper applique and i love circles...right up my alley. put me in the drawing. thanks! This is one giveaway that I REALLY REALLY REALLY would love to win. I love your work and would enjoy the chance to learn your exciting techniques. This is such an awesome giveaway - you guys rock! I've been using the Procion dyes (from kits) to die t-shirts for years and always wanted to buy some other colors, etc., so thanks for the nudge - I just ordered some. 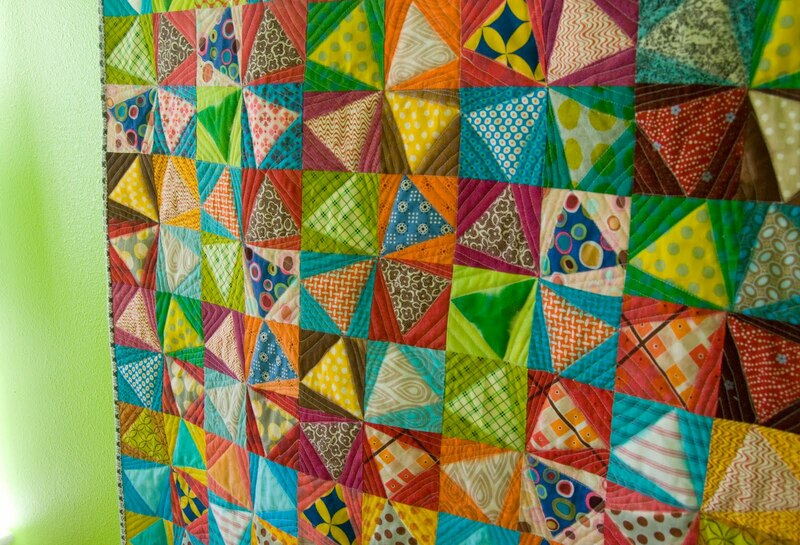 Your triangle quilt makes me drool. Not sure if I'm brave enough to tackle itajime, but it sure looks terrific! Both of those quilts are beautiful! I would love to learn how to make the second one with the circles! It is amazing! I love learning new things, even if it's sometimes scary! If I happen to win I promise to try this technique and send an image of the final product. I make promises because I can't break them, therefore it makes me do things, instead of just thinking about it. Too cool! I'd love to try this. I've been lost in lust for the past month checking out this technique and all the beautiful pieces it makes. Your quilts are amazing! I would love to win this and be excuse free from giving it a go. I am on the fence about trying this, but winning some of the supplies would certainly knock me off the fence. I definitely love the way it looks and why not give it a try? Thanks for the opportunity. What fun!!! Can't wait to try this, whether I win this package from you or not. These are both already on my Christmas list and I've been collecting found objects for using as resists! Love you book and thanks for the chance to win! I would love, love, love to try this! Just looking at the photos made my breath catch! Wow! What a great giveaway and a fantastic tutorial. This would be the perfect introduction to fabric dyeing for me! How awesome! Sounds fun! I would love tot ry it. Thanks for the tutorial, Malka. I'd love to try this. Please count me in. Thanks. Wow, I have been on the fence about trying this out. It is so creative what you are doing and thank you for sharing this with us. okay, I'm finally ready to take the plunge! Wow, this is so nice of her and you. Love your book by the way. I do have a question though - HOW DO YOU CLEAN THE WAX off? That was the only thing I could not find mentioned in the book. And before I try this I would like to know that. I do own quite a few stamps like you used in the book, so I am really excited about this! Okay, I'd have to make the plunge if I won!! I'm ready to dive in!!! i would love to try this technique and if i win the shapes i will do it and love it for sure! As soon as you mentioned the shapes from rossi, I ordered them. I am now just waiting for the time to try them out. I also already have dyes from Dhrama---hope I am still eligible to win. How Exciting! I love your enthusiasm. I am very excited to try out your dying technique. Thanks for writing the tutorial. I am constantly amazed by the generosity you and other craft bloggers show!! it a try....count me in ! Kathy- About removing the wax, check the chapter titled, "Finishing Up: Aftercare for Waxed and Dyed Fabric". 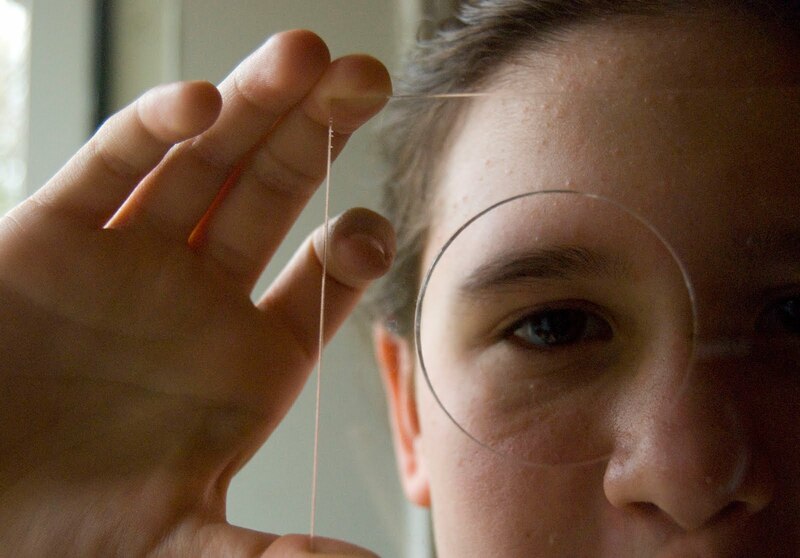 There's a part titled removing the wax that explains how to do just that. Susan- You can't use soy wax with the type of dyeing I detail in the book. Soy wax is water soluble and the dyeing I do is immersion dyeing. If you'd like to use soy wax, you're going to need to use a dye painting approach to coloring your fabric. Wow! my head is dizzy thinking about how much fun it would all be! I love those triangles! and those circles!!! I'd really like to try this technique, but not having the shapes was a big stopper. Thanks for sharing your knowledge. Hey, I am so excited. My Mom is getting me your book for Christmas. Now I need to win this, and all will be so crafty! I love your work and would love to give this technique a try. I've been so fascinated by your technique and would LOVE to try it! Okay, you got me now! I would love a set of shapes to start clamping and dyeing like a crazy woman! I love your new shape in your twinkle quilt, it is truly wonderful!! Congrats on all your wonderful successes! So very nifty! I would love to get into dyeing again. It's so much fun. I love your latest quilt! Would love to get into dyeing. The colors you get are just so vibrant! Saw your Quilting Arts segment and am inspired! What great information! I have a good quantity of dye just waiting to try this. Then to have a giveaway is wonderful. I am fasinated with this technique and want to try it!!!! This would be great to win!!! My order is in to Dharma and I can't wait to get started. i've been wanting to try this technique....my fingers are crossed. thanks for the chance. I cannot wait to try dyeing fabric. Twinkle is gorgeous and reverse Twinkle is pretty cool too. You and r0ssie are both inspirational! i love it... you're brilliant! would love to win the reverse ones! I would love to win. Already have the dye, a gift from an old friend - would love to try this technique - Malka, you are such an inspiration! Thanks Rossie. Just saw this technique on Quilting Arts the other day! It is amazing, Fingers crossed, and hope to win! Malka, I love your book and can't wait to try the dying. I used to dye my own fabric following a tutorial on Lisa Call's blog years ago. Buit for the past several years I have been using commercial fabric and didn't even think of dying it to make it my own - you are brilliant for coming up with this. I've been following your work for years via the quilt national catalogs and never cease to be amazed by you talent and ingenuity. congratulations on your book and it's success - you so deserve it! I love this! I've been wanting to try dyeing, and I've been just a big chicken. I am so encouraged with all of the help that you have offered here, there can't be any more excuses! Thanks so much, and I absolutely love what you did on this quilt! What an amazing ride you are on! "Saves you money!" What would Houston be without those ads? Ok, but really I'm so excited to try this! Thanks for the tutorial and for the great book!!!! I would love to win this giveaway! Already have been doing discharge dyeing and a little itajime. The reverse circles in the giveaway sound exciting. Happy Thanksgiving all! Wow, what a terrific giveaway and collaboration! I just received some of rOssies shapes in the mail and love them. I can't wait to give this all a try this weekend. Such a cool idea. Thanks for sharing! I love your twinkle kit! I've been wanting to try this technique for a while so I think this is the push I needed to give it a whirl! These are wonderful. Christmas a month early! I am so excited. I recently bought your new book, Color Your Cloth, and can't wait to go to goodwill to look for an electric skillet so i can start a project! I have a friend that's been doing it for years and always thought it was too involved, but you make it seem like play and i love to play with bright colors and fabric piecing! You did a great job of explaining the process! So cool! 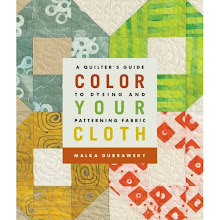 I bought your book, I've been a Dharma fan for years (I typically hand dye my quilt backs - and particularly love Dharma's Quilter's Sateen fabric) and am very intrigued by this technique! These are amazing. I just stumbled on this blog and I love the idea of combining my love of dying with quilting. At any given time I have like 20 pounds of Dharma dyes sitting here.